When we start bringing and consuming the Korban Pesach again (speedily may it be, in our days), will the Korech step of the Seder be moved to adjacent to Tzafun or possibly replaced by it? The reason for Korech is that there was a disagreement between Hillel and his contemporaries, recorded in Talmud Bavli Pesachim 115a (English summary), regarding whether to eat the [Korban Pesach,] matza, and maror together in one wrap (Hillel) or separately (contemporaries). I put "Korban Pesach] in brackets in the previous sentence because whether the Korban Pesach was part of Hillel's wrap is the subject of a later disagreement between Rashi and Rashbam there, who hold that it was, and Rambam in Hilchot Chametz Umataza 8:6-8, who implies that the wrap was only matza and maror, while the Korban Pesach was eaten separately. Tzafun is a placeholder for eating of the Korban Pesach, which, as encoded in Mishna Pesachim 10:8, must be the last food consumed on Pesach night. Therefore, when we restore the practice of Korban Pesach, we will presumably eat it in the Tzafun slot in the Seder. If we follow the Rambam's interpretation of Hillel's practice, then that plus the Korech we're already used to, on the schedule we're used to, fulfills both Hillel's opinion and that of his contemporaries, since they agreed that the Korban Pesach was eaten by itself, at the end of the meal. However, according to Rashi and Rashbam, fulfilling Hillel's opinion would presumably require making a wrap including the Korban Pesach, presumably at the end of the meal. According to Rashi and Rashbam, would Korech have to be at the end of the meal? Would it be before, after, or in place of eating the Korban Pesach by itself (Tzafun)? Is it possible that we will, in fact, practice in accordance with Rashi and Rashbam? Does the current placement of Korech where it is instead of at the end of the meal already indicate that we don't? I think this would be a dispute between Rashi and Rambam, but partly for a different reason. Before we factor in the dispute between Hillel and the Sages (and rishonim's interpretations thereof) we need to define what the essential nature of tzafun is. This appears to be a dispute between Rashi and Rambam. As I noted in this answer the simple reading of Rambam is that the tzafun step is not really part of the mitzvah. The essential mitzvot of matzah, maror and korban pesach are fulfilled by eating those three things prior to the main meal, as Rambam codifies in 8:6 and 8:7. Once you've done that you have fulfilled all three mitzvot. There is a separate rabbinic institution that we should eat the korban pesach again after the meal in order for it to be the last taste in our mouths, as Rambam explains in 6:11. Now if the purpose of tzafunwas just to make the korban pesach be the last taste in your mouth, it would presumably be irrelevant how the mitzvah of korban pesach must be fulfilled. It doesn't matter what Hillel holds, what the Sages hold, or how rishonim interpret that dispute, because that was all already taken care of before the meal when we ate all three items and tried to fulfill both opinions. After the meal we are not attempting to fulfill the mitzvah; we are simply leaving the taste of the korban pesach in our mouths, which should not require any accompaniment of matzah or maror. However, Rashi on Pesachim 119b seems to explain the point of tzafun differently. He seems to assume that the main mitzvah is actually fulfilled by what is eaten during tzafun. If so, then we would presumably fall under the dispute between Hillel and the Sages as to how to correctly do the mitzvah. Thus, according to Rashi's explanation of Hillel on 115a, you would presumably have to wrap all three together for tzafun as that is how you would fulfill the mitzvah in Hillel's view. 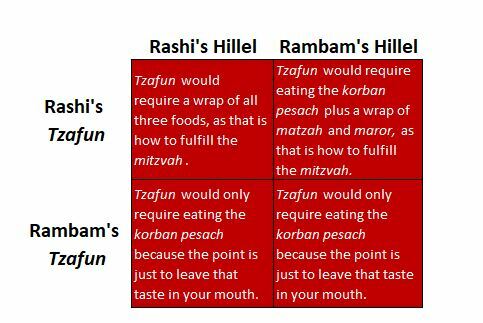 If you mix and match opinions and follow Rashi's interpretation of the nature of tzafun but Rambam's interpretation of Hillel's view then you would presumably have to eat a wrap of matzah and maror after the meal when you eat the korban pesach. Not the answer you're looking for? Browse other questions tagged passover passover-seder-hagada rashi korban maseches-pesachim .